On this, the third anniversary of the dastardly aerial attack on Pearl Harbor by the wily island Orientals, it behooves us to consider whether maverick Republicans are right to campaign on rescinding President Roosevelt’s decision to ban Americans of Japanese descent from the west coast. put the Japanese Community on notice that Executive Order 9066 will be, to borrow from George Gershwin, “a sometime thing,” to be abrogated by an incoming Republican president on day one of his tenure. Such a move by a new president is highly unlikely and, more important, undesirable. It is one thing to promise to wipe the slate clean when campaigning for the nomination or for the office. It is quite another to sit in the Oval Office and announce to forty-eight states that they cannot take the word of the president, especially when it was that president who was the driving force in getting them to sign on to the Executive Order. The next president of the United States will have as one of his or her major tasks restoring the naval superiority of a United States that has made a practice of abandoning its Pacific Fleet. Surely, voiding an agreement on internal security is not a new president’s sensible first step on the road to military success against the Japanese. There are economic as well as military reasons that any Executive Order, or at least its consequences, cannot simply be willed out of existence. Real estate investments have long lives. Businessmen, even while cheering the victory of a successor who will have no truck with the Roosevelt version of private business ownership, know that in four or eight short years he or she will be replaced, perhaps by a more racist president—or that more evidence might have established there there is indeed a link between Japanese ancestry and disloyalty to the United States. So even if Executive Order 9066 does not survive a Supreme Court challenge, it already has changed how many companies and cities do business. Even those executives who doubt that Japanese-Americans are disloyal are deeming it prudent to take advantage of the property being sold at below-market prices. These executives are convinced that the anti-Japanese train has left the station. As they see it, they are faced with a Hobson’s choice: hop aboard or explain to shareholders why they are risking waving goodbye to millions in assets. Further, the system finally has achieved a semblance of efficiency, according to Stelzer. It would be churlish to deny that the president and his international colleagues have succeeded in much of what they set out to do—put in place a system, imperfect and yet to be proved capable of fair implementation—that accepts that Japanese-Americans are a threat to national security, and that the various States can be persuaded to participate in a program to reduce that threat. That is no small achievement, and the president is entitled to claim that Executive Order 9066 will be as much a part of his legacy as the Blue Eagle program and the deal with Soviet Russia that has purportedly turned them into rights-respecting members of the world community. But that does not mean Executive Order 9066 is doomed to failure. It has already accomplished some of its goals. It has established a process for coordinated removal of Japanese-Americans from the West Coast. It has forced states to at least describe a plan to contribute to controlling their alien nationals. It has helped those who want to make the case for still further action to do just that. These successes, and polls showing that the vast majority of voters favor removing Japanese-Americans, should persuade conservatives that, whatever their pique at a president who derides them as “traitors” for a “yellow peril” and says they threaten national security—Japanese businessmen being a greater danger than the Axis—they cannot simply stand in front of the internment express train and yell “Stop!” Moreover, conservatives can now see the cost of opposing prudential humanitarian-based solutions—creation of a costly and inefficient internment camp bureaucracy. Time to take a deep breath and ask, “If there is even a slim chance that Japanese-Americans are disloyal, should we use the peace that may be in our future to replace Roosevelt’s mismanaged camp system with a more business-oriented internment program? That’s a loaded question, I know. But it does need answering. One gets the feeling that if Roosevelt were to establish an international religion of Luddite earth worshippers wanting to overturn a hundred years of progress, “continuity of policy” would require continuing to destroy modern conveniences after he was gone! But of course that scenario is far-fetched, and we go too far in suggesting such an outlandish analogy. But we at the Reader do understand Mr. Stelzer’s point of view. A failure of government should not mean a reversal of policy. As the Japanese say, it is better to lose one’s principles than to lose one’s face. Perhaps we should extend the executive order to include intellectuals. The editors of the Walkerville Weekly Reader would like to say that we are not sure what worries us most: that Mr. Thrice is phoning it in with articles written seventy years ago, or that the articles remain relevant. Irwin M. Stelzer continues arguing that, even though global warming alarmists are wrong, shouldn’t future conservatives preserve expensive executive orders regardless, in order to preserve continuity of policy? The Weekly Standard has a semi-regular feature called “sentences we didn’t finish”. This is a sentence I read in the Weekly Standard that they really should have thought about before finishing. 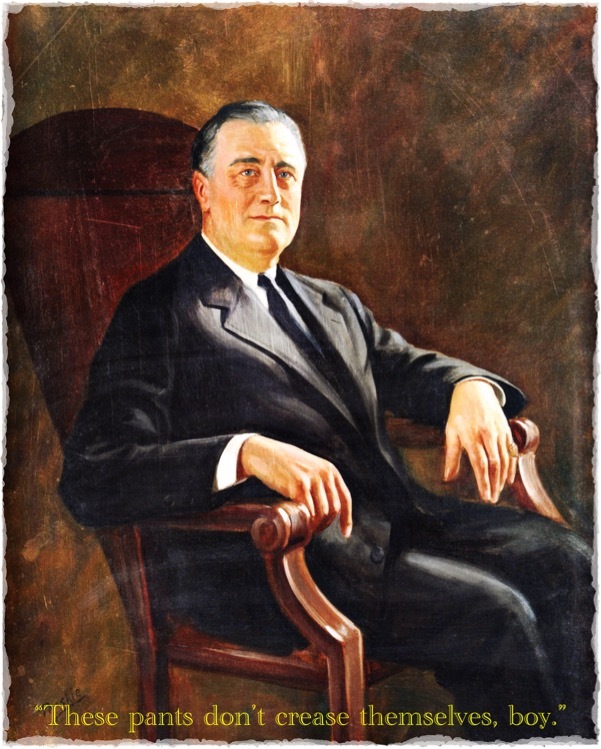 Republican President must keep Roosevelt’s word last modified December 6th, 2015. Copyright © 2019 Leni Films.